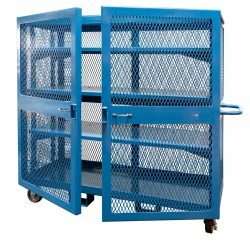 The High Value Cart (HVC) is a portable and secure storehouse that protects valuable tools, equipment, and supplies from theft while allowing easy access for authorized personnel. This heavy-duty cart from BHS is the perfect solution for on-site storage. This reliable storage unit is easy to transport and reposition between work sites. All models are equipped with casters for moving lighter loads across short distances and fork pockets for heavier loads or longer distances. The High Value Cart is made from heavy-duty steel and has a powder coat finish to protect it from wear and tear. Its three steel shelves are adjustable in 3-inch increments. The doors open to 180 degrees for convenient access to supplies. The cart is padlockable and has a strike protector to further deter theft. Protect your valuables with a heavy-duty High Value Cart. Contact our sales team at 1.800.BHS.9500 for more information about Industrial Storage Equipment or to find a local dealer.